I have made quite a few cinnamon rolls in my life. Bread is one of my favorite things to make. Although I find that I don’t make it quite as often as I did when all of our kids lived at home. If you take a look around this blog you will see that there are quite a few bread recipes. It has been some time since I had made cinnamon rolls and then that urge came over me and I had no choice but to make a batch. Do you ever get an urge and it won’t go away until you have completed the task? If so you know what I am talking about. I wanted to make cinnamon rolls, but I wanted something a little different. It just so happens that I was looking through my recipe box when I came upon a recipe that my sister had given me years ago. It was a recipe called cinnamon twist. It was made with a package of refrigerator biscuits. I don’t think that I have ever made this recipe; I tend to collect recipes and then somehow forget about them. But anyway they sounded interesting, so I decided to make a batch of dough instead of making them with store bought biscuits. 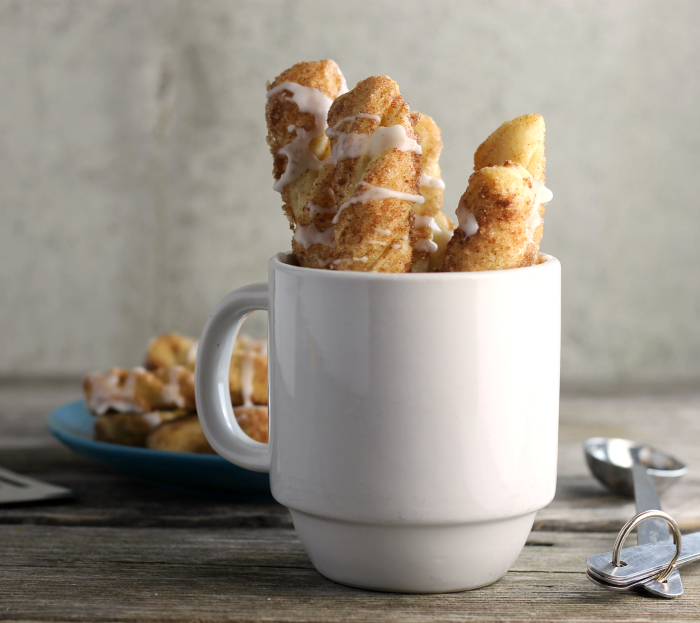 The first time around the dough was too light and fluffy, the cinnamon sugar twists with vanilla icing were bigger than what I was expecting. So I gave it another go around and they turned out the way I was hoping they would. 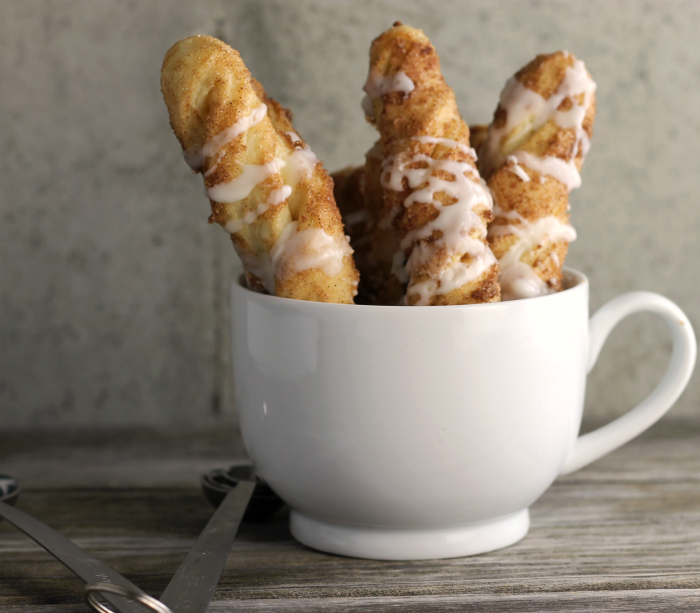 These are a little tricky to make and they take some time, but they are a fun spin on the cinnamon roll and yummy to eat. The twists are brushed with butter then rolled in cinnamon and sugar. I found that it was easier to lay the strips of dough on a plate and brush them with butter, flip them over, brush the other side with butter, and then roll them in the cinnamon and sugar. 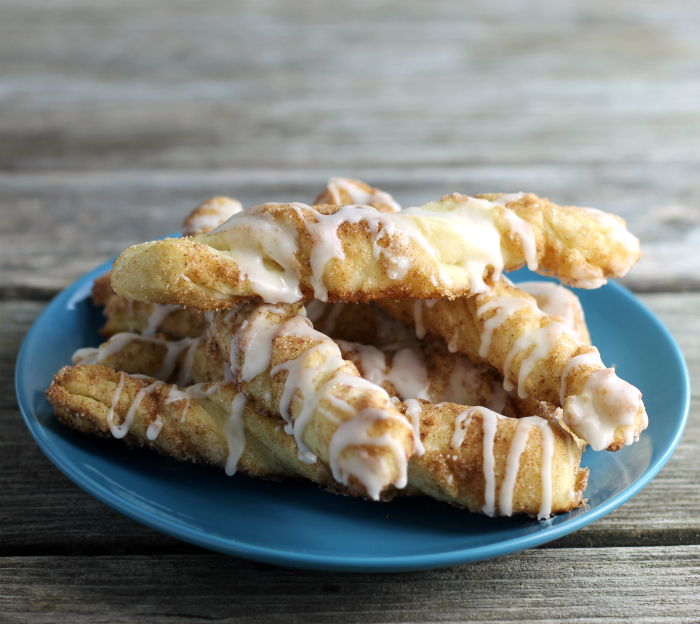 These cinnamon sugar twists with vanilla icing make a large batch so I shared some with my mom and my kids. Such a fantastic twist on cinnamon rolls! Yes, I definitely can empathize with those urges to bake that won’t go away until you have completed the task – and the next time I have the urge to bake cinnamon rolls – I’m so gonna have to try these! My family would love these! I hope to break out the yeast again now that the temps are dropping. But, like you, with a couple kids out of the house, I don’t make bread nearly as much as I used to. I am too a homemade bread fan. 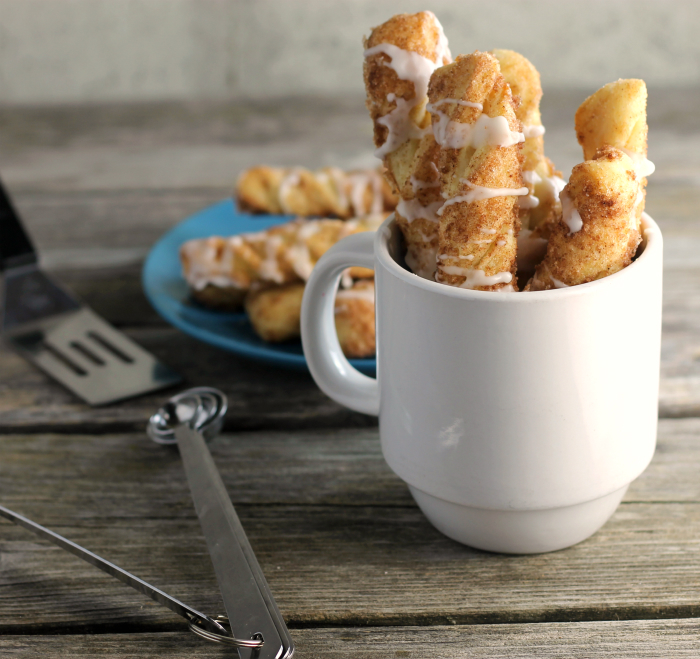 These cinnamon twists look so tempting, Dawn. These twists looks so tempting and beautiful! YUM! I love the twist in the traditional cinnamon rolls. As a special request, is it possible to upload some photos which helps in going through the entire process as that is easier to comprehend and compare notes. I am sorry I don’t have any pictures to upload. If you have any questions, please let me know.